- 1 Quick Start Tool Kit which includes CD-Rom with AED manual, training video, rescue link and MDLink and serial communication cable. New, Rescue Coach™ intuitive voice prompts were designed using the results of a human behavior study to guide the rescuer confidently and easily through the rescue process and provide instructions and AED behavior aligned with the AHA/ERC 2005 Guidelines. The new detailed instructions for CPR include a metronome to assist with frequency of compressions. 4 - Year full operational replacement battery guarantee. 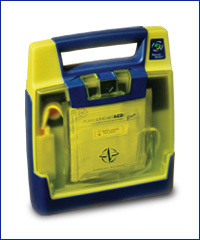 7 - Year AED warranty. - For children or infants up to 8 yrs. old, or up to 55 lbs. - Uses disposable, non-polarized and nterchangeable defibrillation electrode pads. - Attenuates energy to 50J for a child or infant. - Can be used with any Cardiac Science AED G3. - Shelf life: 24 months from date of manufacture. - 1 Quick Start Tool Kit: includes Quick Start Guide, CD-Rom with AED manual, Training Video, RescueLink and MDLink. 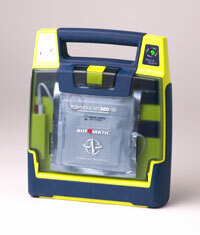 Cardiac Science introduces its professional AED offering—the G3 Pro. Our latest boasts the industry's first ECG color display, provides manual override features, multiple rescue capability, and the most advanced technology available to provide healthcare and rescue professionals extended capabilities for emergency treatment of sudden cardiac arrest and continuous cardiac monitoring. Powerheart AED G3 Pro package with professional ECG color display: biphasic waveform and internal memory, 9145 battery. Non-Polarized, reduced energy (50 Joule) pediatric electrode pads recommended for chest/back placement. Recommended for children less than 8 years of age or under 55 lbs (25 kg) 2 year shelf life. The wireless communication cable allows user to modify AED operational parameters, upload rescue data, and transfer information. The IR Communications Cable is compatible with USB ports via a standard adapter. IntelliSense Lithium Battery for Powerheart AED G3 Pro model 9300P. Warranted for 1 year or 12 hours of use, whichever comes first. includes emegency oxygen cylinder, single flow regulator, tubing, mask, BBP kits and First Aid Kit.